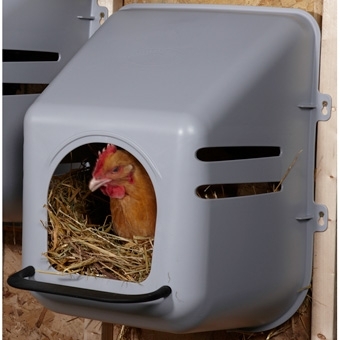 The New Little Giant nesting box provides a dry, clean and dark area for hens to lay eggs. Designed with a space saving modular layout the nesting boxes can be mounted vertically or horizontally side by side. They are easy to mount and remove for easy cleaning. Mounts to a 16 on center stud. Made of high density polyethylene that is easy to clean and will not rust, rot or corrode. The nesting box has a sloped roof to prevent unwanted roosting. Ventilation holes provide fresh air. Designed with a front perch for the hens to land before entering the nest, and the perch is pre installed and secured for shipping.